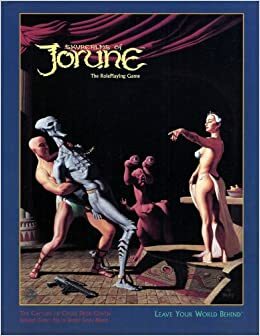 Today at Endgame I ran Skyrealms of Jorune as part of their “Old School” event for Square 1 Roleplaying. I had two players who played, respectively, a human durlig farmer (in Jorune jargon, a Toth) and a bronth private detective (a Yordeh, or Yiordeh depending on which you think is a misspelling). The game was overall fun, though I felt during and after that it hadn’t quite come up to where I wanted it to be, owing mainly to my getting lost in the rather byzantine rules system. The character creation section of Jorune 3rd edition proved to be a throwback to the bad old days of roleplaying – in order to create a character I had to dig through not only the “Character Creation” chapter, but the “Isho” chapter and the “Combat” chapter as well. There was no single place that listed all the steps needed for character creation, and the process grew very protracted and tedious. I estimate it took a good 12 hours to create the six characters – more time for the early characters, less for the later ones as I got skilled. By the final character I had the process down to no more than 40 minutes or so. The idea of trying to sit down at a table with several interested parties and wade through character creation all at once gave me willies. Creating the Muadra was particularly difficult and time consuming because there are a number of skills that are found in the “Isho” chapter rather than the character creation chapter. So anyway, it took me awhile. Too long really, because by the time I was finished with the characters I felt a) a bit disheartened by the whole affair and b) like I had spent a lot of time doing something that was largely a wasted effort (by the time I finished all the characters I knew I was only going to have two players). Characters in “Skyrealms” tend to have a fair number of skills at what we would today think of as a pretty low level. Skills are rolled on a d20, with the player trying to roll equal to or under the skill rank. Skill ranks of 6-12 are not uncommon, and when creating characters one must spread a very limited number of points rather thinly. One mitigating factor for this is that in addition to ranks, skills also have a level, ranging from unskilled to familiar to experienced to seasoned. The higher your skill level, the less you have to worry about routine tasks. So for example a character unfamiliar with durlig farming would need to roll – probably against a skill rank of 5 or less – in order to accomplish even the most routine tasks involving durlig farming. However, a character familiar with durlig farming would never need to roll when undertaking routine durlig farmer tasks. Seasoned characters would need to roll only under the most difficult of circumstances. This cut down somewhat on the number of dice rolls, and meant that the low numbers were mitigated somewhat. Casting dyshas is also a rather complex process, involving the character’s affinity with certain types of Isho (of which there are seven, corresponding to the seven moons of Jorune), skill ranks with each individual dysha (spell) known, number of Isho points (mana) used to power the spells, and a number of rarified skills which Muadra can take to modify their dyshas and perform other neat tricks. Roll for Advantage. This determines whether your character can attack or defend, attack and defend, attack and defend with a bonus, or basically stand there flat-footed for a round. (Important note – you have ~50% chance each round to be limited to doing nothing or to merely defensive actions. What this means is that for about 25% of any combat you and your opponent basically stand there and stare at one another). When rolling for Advantage High = good, Low = bad. Assuming you can attack, roll to hit. When rolling to Hit Low=good, High=bad. Assuming the attack is not blocked, roll for hit location. This is a straight d20 roll, but since the head is the prime locale, Low=bad, High=good. Now that you know where you hit, roll to see if you penetrate armor, if any. This time you roll 2d6. Low=bad, High=good. Now, at last, roll for injury. Again 2d6, and again Low=bad, High=good. For those of you keeping count, yes that is a whopping 6 rolls just to whack someone with a mace. There are, of course, modifiers for all these rolls. AND once you start taking injuries, you need to keep track of the severity and location of each, as minor wounds to the legs have different effects than a minor wound to the arm or torso. I confess that I did a lot of hand waving in the combats we got into. In part this was because one of the characters had no real skill at fighting whatsoever, and I didn’t want the player sitting around doing nothing during a protracted fight. But in part I also wanted to reduce the number of steps required for a single attack because six seemed like too many for me. So now I have gripped. And I think that the game system is worthy of quite a bit of criticism if you hold it up to the standards of today (or even the standards of 1992, which is when 3rd edition was published). … the world is lovely. It is rich and full and inspired. It has a background, and there is a real attempt to explain not only how the magic system works but why, and how the Isho field surrounding Jorune affects everyone. There are numerous sentient races on the planet, and while some of them are very much the “humans in suits” sort of aliens, there are also some that are truly weird and delightful. Thriddle are, IMHO, one of the coolest races ever developed, and for their sake I regret that “Skyrealms” didn’t generate a larger following and petered out to die an ignominious death brought on by poor sales and wrangling over copyright ownership. Despite the system, I would run it again. I might do so at this year’s Big Bad Con, or at Pacificon.